Minnie is ready to do her princess thing! 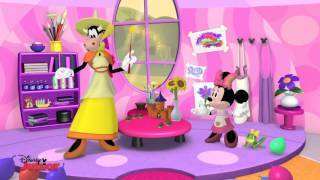 Minnie wasn’t always ready for Prince Mickey’s Grand Ball; but thanks to the help of her very own Fairy Godmother, Clarabelle, she takes a magnificent carriage and arrives in a beautiful gown that is perfect for a princess. At the Grand Ball, Minnie catches Prince Mickey’s eye and they dance a beautiful enchanted dance. But at the stroke of midnight, will all be lost? Now it’s up to Prince Mickey to find the princess who fits into the lost glass slipper. Join the Clubhouse Gang for this and four other Minnie-riffic adventures!